Community forester Kim Bomberger, of the Kansas Forest Service, and Rod Straub, Osage County Extension agent, prepare the roots of a Shumard oak before it is planted in Burlingame’s Sumner Park. 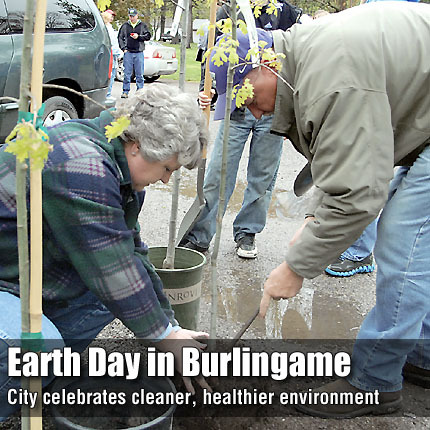 BURLINGAME—As people around the world celebrated Earth Day Friday, citizens in Burlingame celebrated infrastructure projects that will improve their hometown. In honor of Earth Day, USDA Rural Development recognized the city of Burlingame for investing in its future by partnering with the agency to improve the city’s sewer system. Those who attended the April 22 celebration first gathered in the city’s Sumner Park, where two Shumard oaks and one red oak tree were planted with instruction by Kim Bomberger, district community forester with the Kansas Forest Service. The federal government is providing the city with a $1.65 million loan and $550,000 grant for the second phase of the sewer project, and the Kansas Department of Commerce is providing a $500,000 community development block grant. The city began repairing the sewer system in 2010, and received an $890,000 loan from USDA Rural Development by utilizing American Recovery and Reinvestment Act funds. In addition to the federal funds, the initial project also received a $500,000 community development block grant. The total amount provided by the state and federal government is $4.09 million. From the park, the celebration moved to the Schuyler Museum annex, where cake and beverages were served. USDA Rural Development Manhattan Area Director Philip Neary addressed those at the celebration. Other government officials attending the event were state Rep. Willie Prescott, Burlingame Mayor Ray Hovestadt, Burlingame City Council members Carolyn Strohm and Vikki DeMars, Burlingame City Clerk Patti Gilbert, Osage County Economic Development Director Stephanie Watson, and Osage County Extension Agent Rod Straub.